I'm so glad you took the time to visit. 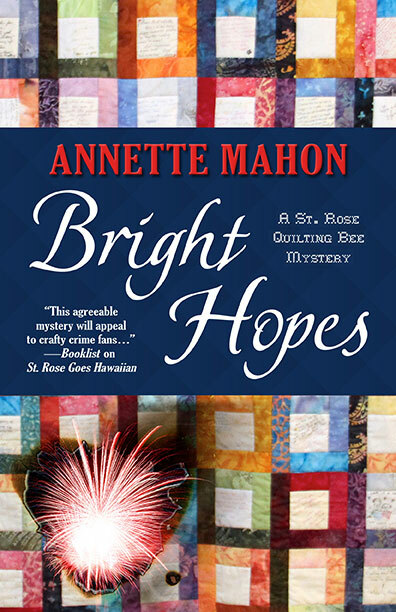 Here you can learn about my Hawaiian romances, my cozy mysteries, or more about me. I also share some of my quilts, several of which are featured in my novels. I'll direct you to some fun links - links to help you learn more about writing, quilts, Hawaii, Scottsdale, and more. I'd love to hear from you. Contact me and share your thoughts about my books and quilts. I love to hear from my fans as they make writing worth while. Loud explosions are ruining sleep for hundreds of Scottsdale residents in the hot July nights, including members of the St. Rose Quilting Bee. Things become serious when Michael Browne, Maggie’s police officer son, is injured by one of the blasts. Then a church member dies when an explosion topples a roof onto the lounge chair where he lies sleeping. Most of the Bee members think bored teenagers may be playing with fireworks, but Edie is thinking terrorists. The others scoff, until a bomb at a power substation throws the entire neighborhood into darkness. Suddenly, terrorism is a real possibility and the national media descends on the neighborhood. The quilting bee women work through some convoluted theories trying to get to the bottom of the “noises in the night,” as they suspect a local connection to the death of their fellow parishioner. Are there terrorists working in Scottsdale, or is it a clever murderer covering his or her tracks? Note: The cover quilt is a variation of the Bright Hopes pattern, made by Annette for her daughter.